With population growth and a rising high school graduation rate, Alabama’s high schools are producing more graduates and they are sending more graduates, in absolute numbers, to higher education. However, at the same time, a slightly smaller percentage of graduates are moving directly into higher education. In 2016, 63 percent of high school graduates enrolled in college in the year after their graduation. That compares to a 65 percent enrollment rate in 2014. That’s according to new data released by the Alabama Commission on High Education (ACHE). The data from the report is drawn from the National Student Clearinghouse, which tracks student entry and progress through higher education. 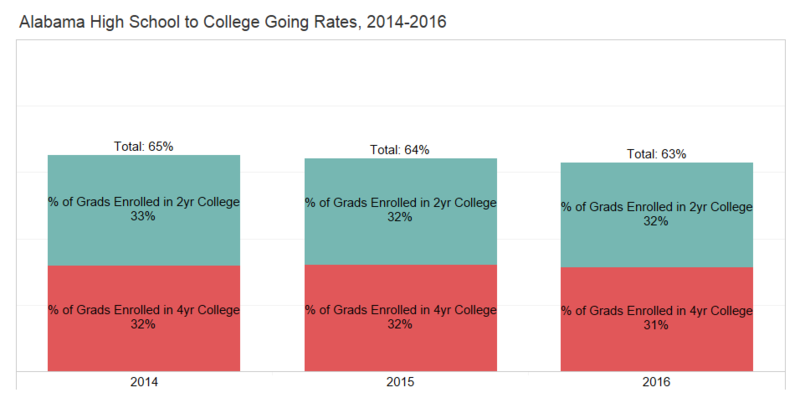 College-going rates and college destination statistics for the state, for systems and for individual Alabama high schools can be found on PARCA’s Data Dashboard. The findings in the most recent report are similar to patterns identified in another recently released dataset from ACHE, its high school feedback report. PARCA’s analysis of that data shows that though a slightly lower percentage of graduates are enrolling in higher education, those enrolling appear to be better prepared since a smaller percentage of those enrolled students are placed in remedial education after graduation. Alabama trails most U.S. states when it comes to educational attainment, with a smaller percentage of Alabama’s population aged 25-64 holding a college degree. Higher levels of educational attainment produce higher incomes and more job stability in an economy which increasingly demands education beyond high school. To close the gap with other states, Alabama needs a greater share of its population obtaining higher education credentials. But, according to the most recent comparative data, Alabama trails the national average and lags behind all other Southeastern states in the percentage of high school graduates going directly into college. A deeper dive in the data shows how diverse the state’s educational eco-system is. Across the state, systems vary widely in the percentage of graduates who go on to higher education. Some patterns are predictable: affluent suburban districts tend to send most of their graduates to college at four-year colleges and universities. In general, high schools where more students are affluent have a greater share of students going on to higher education. In schools where poverty rates are higher, a smaller share of students go on to higher education (See this chart that compares college-going rates with the proportion of poverty students at a high school). However, a greater variance appears when the percentage of students going to two-year colleges is considered in the mix. So, it’s not a surprise to find the Mountain Brook City School System topping the college-going list, with the highest percentage of graduates going on to higher education. Over 90 percent of Mountain Brook’s 2016 graduates enrolled in college, with the vast majority of them (86 percent of the graduates) entering a 4-year college. Only 5 percent of graduates enrolled in a two-year college. More unexpected is the system that finished third on the college-going list. Brewton City Schools also had an impressive college-going rate of 85 percent, but the destination of Brewton’s graduates was different from Mountain Brook’s. In that system, 48 percent of graduates enrolled in a two-year college, while 37 percent went to four-year schools. Those varying paths toward achieving a high college-going rate continue throughout the rankings. Among the top 20 systems, 9 systems lean heavily toward 4-year college-going and 11 lean more heavily toward 2-year college going. When examining the college-going rates at individual high schools, the same contrasting picture of college destination is apparent. Some high schools achieve a high college-going rate by sending most graduates to four-year schools, while others send a high proportion of students to two-year colleges and thereby have high college-going rates. In some systems, there is a significant variance among the high schools within the same school system. This is particularly true in systems that have magnet high schools (schools where students from throughout the district can apply to pursue advanced academic options). This is most readily apparent in Montgomery County. Three magnet high schools in the Montgomery County system, Brewbaker Technology Magnet High School, Loveless Academic Magnet Program, and Booker T. Washington Magnet High Schools rank in the top 10 among high schools for the percentage of students enrolling in college the year after graduation. All three send close to 90 percent or more of their graduates to college, and most of them to four-year schools. By contrast, of the 2016 graduates of Lanier Senior High School, only 34 percent enrolled in higher education, according to the Clearinghouse data. In terms of national comparisons, Alabama has historically ranked low in educational attainment. The U.S. Census Bureau estimates 34 percent of Alabama’s population between the ages of 25 and 64 have an associate’s degree or higher. That ranks Alabama 9th lowest among U.S. states.